How keen are your code-cracking skills? How refined is your spatial awareness and how sharp your straightforward eyesight? Strategic planning? Is this the season of reason for you? If your answers are "mighty" and "I leap logic for breakfast" then this is the comic for you! Comic...? 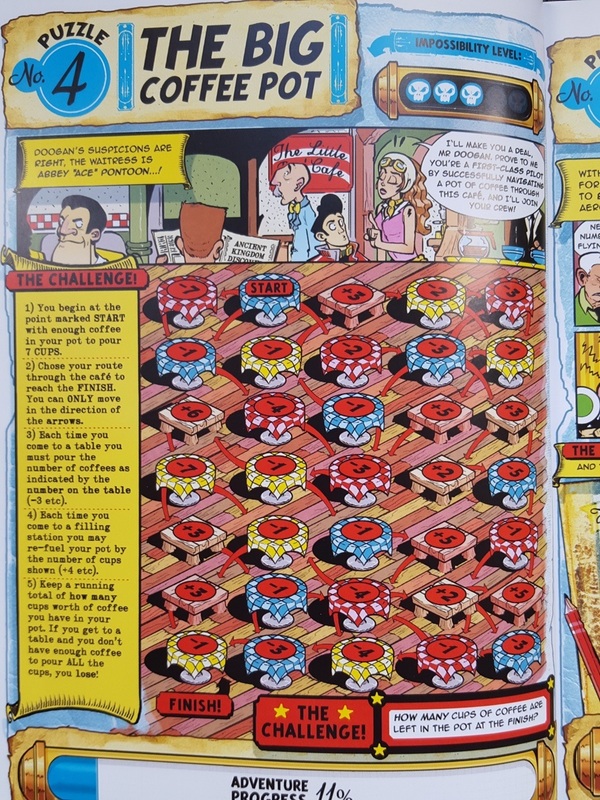 Why yes, from THE PHOENIX comic weekly, that stable of thoroughbred storytelling, this is both a death-defying, danger-driven, neurotic, exotic comicbook adventure and a set of 37 mind-frazzling puzzles so grin-inducing fiendish that they will ruin other puzzle books for you. 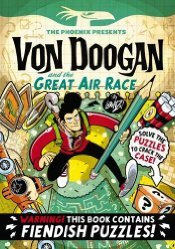 Except for Lorenzo's previous puzzle-comic VON DOOGAN AND THE CURSE OF THE GOLDEN MONKEY, of course! See through a disguise in a crowd by piecing together what someone's torn up and trashed. Escape through the burning wreckage of a fuselage using fire extinguishers to clear paths through a maze - but each fire takes up a whole tank and you can only carry two extinguishers at once - it's trickier than you think! Repair circuitry, avoid collision, and identify which pilot is flying which plane based on a series of statements. 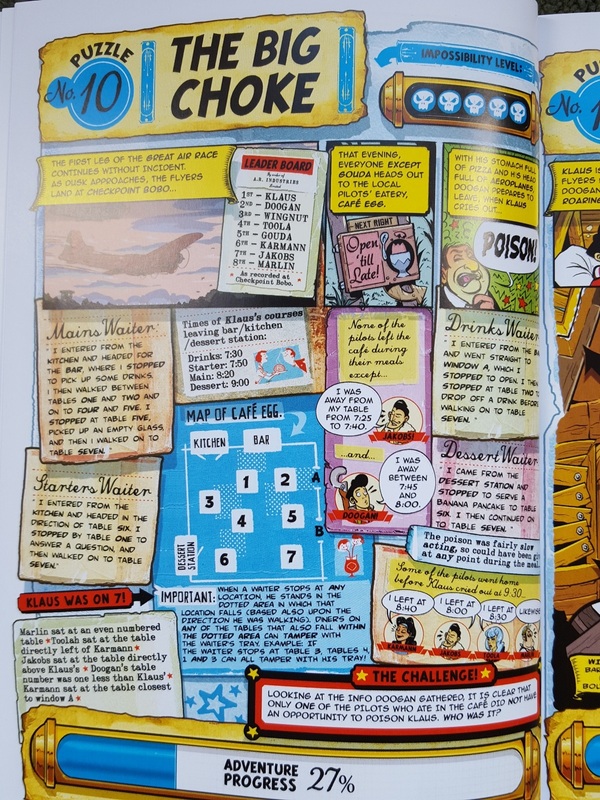 Best of the lot: after examining a map of a cafe and 8 separate pieces of time-specific and location-centric evidence from 4 different waiters, work out who was the only diner that night who didn't have an opportunity to poison competitor Klaus! Impossibility Levels ranging from one to five indicate how much of a meal you might make of things. With puzzle 1, 'Sandwich Secret', you're looking at a light snack - no, you actually are! There's a tray in front of Von Doogan bearing sandwiches, a drink with a straw and umm, a triangle (because triangles are tasty?) 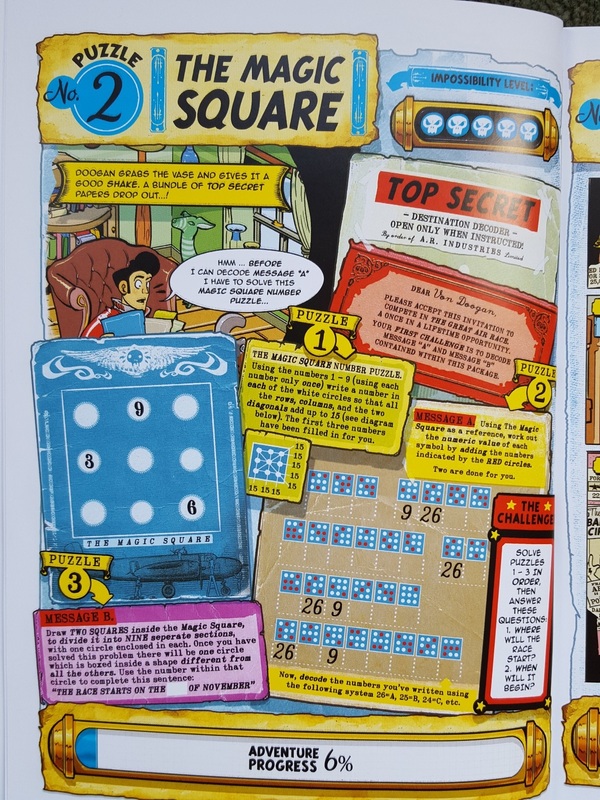 You need to summon your spatial awareness skills to work out how each of the items would look to Von Doogan (who's facing you) in order to decode a secret message, thence a secret location around you in the room. This has an Impossibility Level of Two Skulls. But up immediately next is The Magic Square puzzle whose solution will enable you to work out numeric values of similarly square but quite complex symbols which when translated into letters in turn reveal the location of a race, after which there's another challenge to discover its date... all on the very second page! This has an Impossibility of Five Skulls - Five Skulls already! What I'm trying to convey is that these are far from straight forward, and you will at the very least need a pen and scrap paper, a pair of scissors and Doogan's Danger Kit, a copy of which you can download from an address in the back so you won't need to cut up the book (or you can trace shapes and use coins). You will also need maths skills. Not advanced mechanics skills, but maths skills all the same. At one point to you have to determine how long you've got to rescue a pilot bailing from her plane by calculating how long her parachute drop takes when freefalling then open, after which how long she can survive at sea during specific water temperatures. There are clues in the back if you struggle on any particular page and then the solutions. I think I found an additional solution to 'The Dreaded Fog' which didn't involve me crashing my plane and which may have moved me ahead in the race! Umm, it might also have got me disqualified. I cannot begin to tell you how much glee I gleaned from this, but I do wonder if you'll work out long before I did exactly which character is attempting to sabotage your best efforts to win this whacky race. There is a certain logic I should have seen through earlier, and I think you may rechristen me Dumbo. Do let me know! 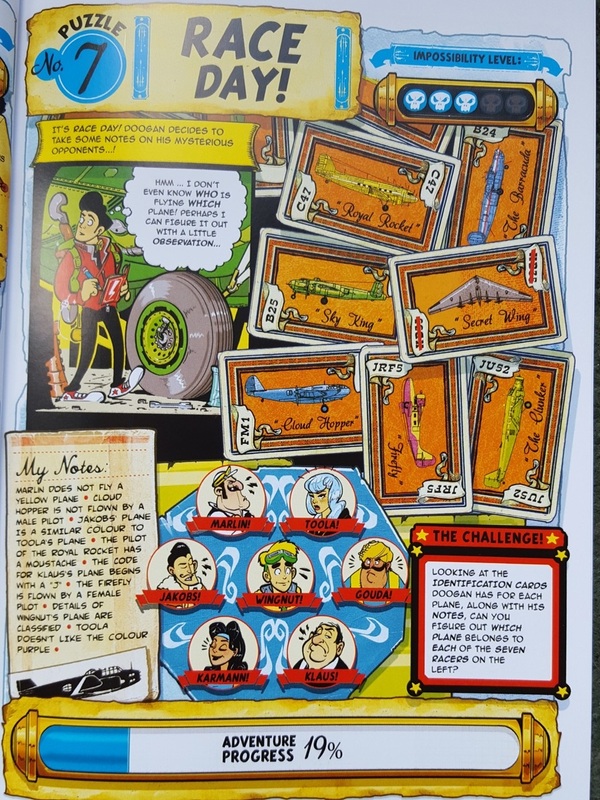 For laugh-out-loud Etherington Brothers idiocy (Lorenzo being joined by Robin), please see their LONG GONE DON and MONKEY NUTS graphic novels.